Home School Navigator Reading and Language Arts Curriculum is an online-based reading and language arts curriculum. I’ve been trying it out with my oldest child, who is just finishing up with fifth grade. Even though I only used this for my oldest child, I was really curious about all the levels, so I took a look through them all. When you sign up you can look through all the levels, too. After a month, you’ll be limited to the level that you choose for your child, but you’ve got a whole month to figure out the appropriate level. 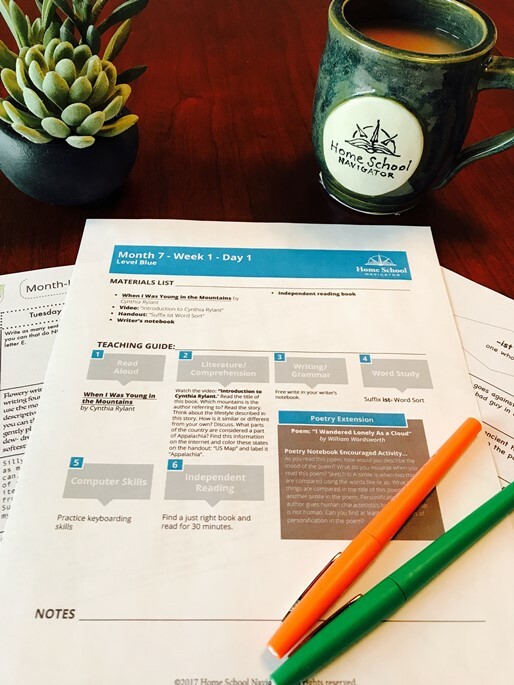 First, I’ll tell you what I concentrated on with my son during the time I’ve had to review and use this curriculum, and then I’ll get into the general info and more features that I tried out with him. We chose to do one of Home School Navigator‘s interactive notebooks and focus on that during the review period. The interactive notebooks are done using plain composition notebooks. They are an interesting blend between regular notebooking and lapbooking. I wasn’t sure what level I’d put my son in (more on that in the general section), but we settled on doing the interactive notebook from Level Indigo, which is for the book Holes, by Louis Sachar. There are a lot of general comprehension questions, vocabulary, and literature questions (like “what is personification”), and some personal application questions. It ends up being like a very thorough, chapter-by-chapter book report. In this picture you can see a page of work, where my son has cut out the activity, filled in his response, and glued it into his spiral notebook. You can also see a bit of the notebook that hasn’t been finished yet, and the beginning of the answer key that goes with it. He got most of the way through the notebook. This part worked out ok for us. My son is NOT a fan of doing any kind of report. He’s typical for a 5th grade student. He’s done lapbooks in the past but feels like he’s kind of outgrown those. This was a good bridge between the structure of a lapbook and the length of a report. On the one hand, doing this kind of thing takes more time and stretches out what is for him an unpleasant task of having to answer comprehension questions. On the other hand, it makes answering those questions more fun, and provides a finished project to show off and share. The (almost) finished project wasn’t particularly beautiful and didn’t turn out as “showy” as a lapbook usually does, but at this point he’s outgrown lapbooks. If we do another of these I’m going to help him put a bit more effort into making the final project prettier. I’d rather do it on loose-leaf paper and put it into a nicer report binder. My son reads really fast, so he had read the entire book before he really even started on the notebook. Then, he was faced with just doing the notebook, rather than breaking up the work of the notebook with the fun of reading the book. In hindsight, I’d try harder to limit how fast he read the book when we want to do one of these. When we’ve done lapbooks in the past, I was reading the book aloud to all my kids, so I set the pacing. Overall, this would be a lot of fun for some kids, and it made an otherwise painful task bearable for my son. The interactive notebooks are well done. The levels of the curriculum are organized by Roy G Biv. V (for Violet) is supposed to be at a 5th grade reading level. I’d be flexible about that because the books are good for a range of readers. If you check the lexile scores for the books, they might range from 4th-7th grade. There are chapter books in the Indigo level that I would be totally comfortable assigning to a 7th grader. Chapter books start in level Green. There are a lot of shorter books in each level. In the Indigo level, which is the highest difficult level, there are four chapter books for the year. If you’ve got a student who is new to literature studies, this program would be a good place to start. The student worksheets include graphic organizers and they’re pretty easy to follow. I like the inclusion of graphic organizers a lot because my kids are the type of kids who do well with them. The story selections are fun, common stories that children enjoy. Because you’ll be going to the library or purchasing the book separately, the books are easy to find and this plan uses more picture books than others do – and I like that a lot. Children go through a picture book stage and I see no reason to rush them out of it, but a lot of boxed curriculum cuts out picture books to keep costs down. Picture books can easily be $10-$20 each, and if you were to have to buy a few each week the cost of including something like that in a packaged curriculum would quickly add up. The Home School Navigator online reading and language arts plans are comprehensive and easy to follow. There’s a monthly plan that shows what is going to be covered, so if you need a scope and sequence for your own reassurance or as something you need to turn in, you’ve got it. The program also helps you keep a portfolio, and you can do so online if you want to upload assignments. You can keep track of which assignments are done by checking it, and even submitting it, into the online account. Personally, I prefer to do this the old-fashioned way and just use paper, but I’m sure this would be a good feature for some. Then there is a separate at-a-glance type organizer that shows the handouts you’ll need for each week. This type of overarching explanation gives you a chance to be at the helm of what you’re teaching your child. If your child doesn’t understand a concept and needs more help, you can easily look it up. If your child already knows it really well, you can skip it and spend time on something else. I’m one of those very visual people and I generally have a hard time navigating websites that have online curriculum. I want to see the whole picture. Homeschool Navigators has a weekly guide that I downloaded, and that helped. It’s in a flow chart sort of format. I felt like I had a good idea of what we needed to do and where we would be going. The program is set up so that you can pick and choose what you want to do – you don’t need to do every activity. There are a lot of options and you don’t have to do them all – again, just pick the ones your children are interested in. If you want to step out from box curriculum but aren’t sure what to do, this could help you. If you’re an obsessive box-checker, this still might work for you because of the flow chart format of the weekly guides. If you’re struggling with teaching your child concepts or leading lessons, Homeschool Navigator helps out with parent and student videos. They’re casual but informative and personable. Not slick and professional – you can see that these are teachers who use these products and want to help you use them, too. They’re not just actors. The videos are there to help you explain concepts to your child, so you don’t need to worry if you missed something when you were in school. I taught public school for 7 years so they’re not something I need, but I’ve talked to a lot of homeschool parents who might really enjoy this feature. The videos use some “school at home” methods like pocket charts and word walls. Those are very “school at home” to me because I used those as a public school teacher, but they are also methods that children enjoy and they can be really useful for explaining concepts. My son didn’t enjoy the videos enough to watch them on his own for fun, but they were an acceptable part of school for him. 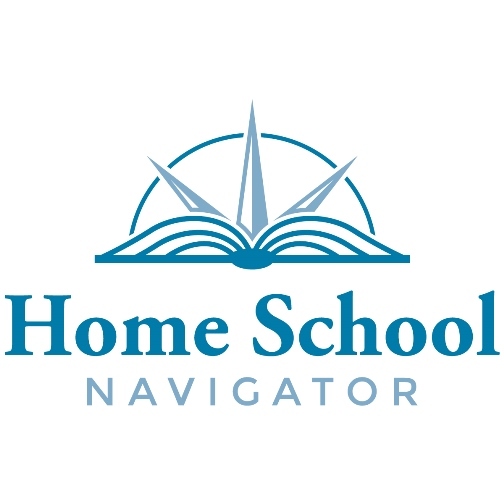 Homeschool Navigator is going to be something to strongly consider especially for people who are newer to homeschooling, or have been struggling with accountability in homeschooling, or who need/want to do portfolios. It’s $97 for a one year membership right now, which includes the teacher’s guide, instructional videos, and student handouts. You’ll need to buy or borrow reading books to go with that. That seems like a reasonable price for a year of solid Language Arts curriculum to me and this should definitely be on your list to consider if it might work for your situation. I have not heard of the is curriculum before! I’m just starting to think about the coming year and not really even “looking” yet. Do you get a list of books used once you sign up? Do you pay extra if you want to do an interactive notebook? Are you considering this for your younger children? I did look at their website. I loved seeing everything covered on a single page…but no book titles. I did see interactive notebooks cost extra. Thanks! All the book titles are accessible once you’re signed up. I’m not sure if they have some kind of free trial or limited access to see a bit more before you decide. There are a lot of reviews for this curriculum if you follow the link to the other Schoolhouse Review Crew link page. I *think* the interactive notebook came with the subscription, but you can buy them separately for a reasonable price. I’ve bought separate lapbooks before for about the same price elsewhere. I’d use it for a younger child if I didn’t already have stuff to pass down, and a house full of books to use. I really like the picture books they selected, especially if a child isn’t liking Classical or Charlotte Mason style literature. Kids like fun books and I use both styles.